Because I don’t like their plans for a value-added tax, some people seem to think that I am politically opposed to Rand Paul and Ted Cruz. That’s not true. Both Senators are generally strong proponents of free markets and limited government, so the fact that they have one bad policy position shouldn’t a disqualifying characteristic. But since I’m a policy wonk (and because I work at a non-profit think tank), it’s not my role to tell people how to vote anyhow. Instead, my niche in life is to analyze policy proposals. And if that means I say something nice about a politician who is normally bad, or something critical of a politician who is normally good, so be it. In other words, nothing I write is because I want readers to vote for or vote against particular candidates. I write to educate and inform. With all those caveats out of the way, let’s look at the federal government’s odious handouts for the ethanol industry, a very important issue where Rand Paul and Ted Cruz unambiguously are on the side of the angels. My colleague Doug Bandow summarizes the issue nicely in a column for Newsweek. Senator Ted Cruz has broken ranks to criticize farmers’ welfare. …Senator Rand Paul also rejects the conventional wisdom…the Renewable Fuel Standard, which requires blending ethanol with gasoline, operates as a huge industry subsidy. Robert Bryce of the Manhattan Institute figured the requirement cost drivers more than $10 billion since 2007. …Ethanol has only about two-thirds of the energy content of gasoline. Given the energy necessary to produce ethanol—fuel tractors, make fertilizer and distill alcohol, for instance—ethanol actually may consume more in fossil fuels than the energy it yields. The ethanol lobby claims using this inferior fuel nevertheless promotes “energy independence.” However, …the price of this energy “insurance” is wildly excessive. …”By creating an artificial energy demand for corn—40 percent of the existing supply goes for ethanol—Uncle Sam also is raising food prices. This obviously makes it harder for poor people to feed themselves, and raises costs for those seeking to help them.” Nor does ethanol welfare yield an environmental benefit, as claimed. In fact, ethanol is bad for the planet. …Ethanol is a bad deal by any standard. Whomever Iowans support for president, King Ethanol deserves a bout of regicide. Here’s some of the Wall Street Journal’s editorial on the topic. Mr. Cruz does deserve support in Iowa for…his…lonely opposition to the renewable fuel standard that mandates ethanol use and enriches producers in the Hawkeye State. The Senator refused to bow before King Ethanol last year, and he’s mostly held fast even though Iowa is where anti-subsidy Republicans typically go to repent. …the Texan is right that ethanol is one of America’s worst corporate-welfare cases. The mandate flows in higher profits to a handful of ethanol producers and keeps the price of corn artificially high, all other demand being equal. This raises the price of food. Al Gore and the greens once supported ethanol but gave up on it when studies showed it did nothing for the environment because of the energy expended in its production. So for those of you keeping track of this outsider feud on your establishment scorecards, mark ethanol as one for Mr. Cruz. In this case he’s standing on principle. 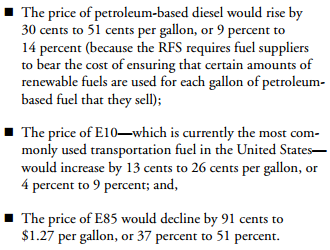 Not only does it raise the price of food, Washington’s mandate for ethanol use (the “renewable fuels standard”) means higher prices for motorists. Here are the key findings on the topic from the Congressional Budget Office. While Senators Cruz and Paul are fighting on the right side, Donald Trump is cravenly bowing to the special interests that want continued ethanol handouts. Jillian Kay Melchior explains for National Review. One of the most destructive environmental subsidies in the United States has found an enthusiastic supporter in Donald Trump. “The EPA should ensure that biofuel . . . blend levels match the statutory level set by Congress,” he said yesterday in Iowa, adding that he was “there with you 100 percent” on continuing federal support for ethanol. …federal support for ethanol is a bum deal for Americans. Under the 2007 Independence and Security Act, Congress mandated that the United States use 36 billion gallons of biofuels, including corn ethanol and cellulosic biofuel, by 2022. And the federal government not only requires the use of ethanol; it also subsides it. Tax credits between 1978 and 2012 cost the Treasury as much as $40 billion. Moreover, numerous other federal programs, spanning multiple agencies, allot billions of dollars to ethanol in the form of grants, loan guarantees, tax credits, and other subsidies. …Ethanol-intensive fuel blends can wreak havoc on car, lawnmower, and boat engines. In fact, many vehicle manufacturers will no longer offer warranties when ethanol comprises 10 percent or more of fuel; engine erosion simply becomes too common. …perhaps it’s not surprising that Trump likes federal support of ethanol. After all, the real-estate mogul’s business model has historically hinged on using tax abatements and other subsidies to make his building projects profitable. …Trump’s support for ethanol belies his populist Main Street rhetoric. In reality, he’s just another rich, East Coast politician who would prop up special interests at the expense of the taxpayer. The bottom line is that ethanol handouts are one of the most notoriously corrupt subsidies that are dispensed by Washington. They also violate my Bleeding-Heart Rule by imposing costs on lower- and middle-income people to reward politically connected fat cats with deep pockets. Policy makers who oppose ethanol deserve praise, especially when they are willing to say and do the right thing in a state (like Iowa) that has a lot of recipients of this execrable form of corporate welfare. P.S. I will get really excited if a candidate goes to Iowa and explains that we should get rid of the entire Department of Agriculture. For those who want to keep the ethanol subsidy, don’t complain about the bailout of NYC banks. It’s only a subsidy.